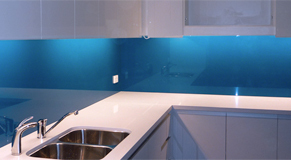 Fully Accredited Frameless Glass Installers, 5-Year Product Warranty, 7-Year Workmanship Guarantee, High Quality Frameless Fittings, Strong Reputation - Newcastle, Lake Macquarie, Hunter Valley, Maitland & Central Coast. Frameless fixed & sliding glass shower screens supplied & installed to Australian Safety Standards with 10mm toughened glass - the smart choice! Frameless bathroom splashbacks are available to measure in your choice of colour for a perfect match to your room & decore. 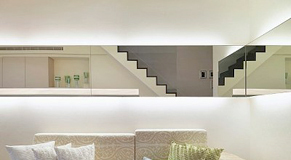 Frameless glass mirrors are available in a wide variety of shapes & sizes. All supplied & installed to Australian Safety Standards for your peace of mind. 5 year Product Warranty & 7 year Workmanship Guarantee. 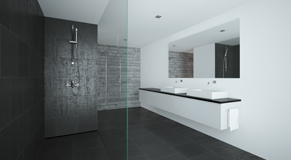 Tuff Stuff Design is the smart choice for frameless shower screens, bathroom splashbacks & wet-area, frameless glass mirrors. We provide a 5-year product warranty & 7-year workmanship guarantee to help give you peace of mind! Our fully accredited frameless glass installers operate to Australian standards and use high quality fittings & hardware for the perfect finish to your next bathroom renovation.